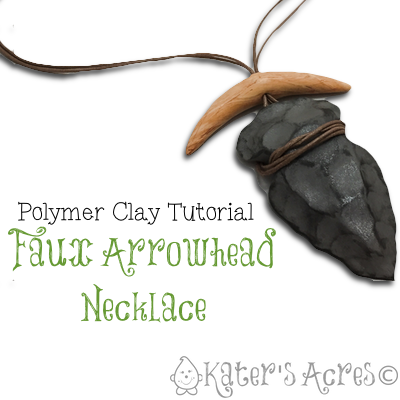 Learn how to make your own faux arrowhead with faux bone components for this prehistoric necklace relic. Parker’s Clayful Tutorials Club Members are taking a journey through time this month with our Prehistoric Theme. Don’t miss these other prehistoric tutorials. Here’s a quick, easy, and fun tutorial to go along with our Prehistoric Theme for the month. Are you ready to make your own faux arrowhead necklace with this tutorial? Here we go! Prepare and condition dark grey polymer clay. Shape polymer clay into a teardrop. Smoosh teardrop onto your work surface. Use pinky fingers on either side of the wide end to indent slightly. Take the wide end and pinch flat on the edges. Repeat the same pinching process on the sides of the arrowhead. Gently remind the shape with your fingers while on the work surface. Use you blade to cut “chunks” out of the arrowhead. Use fingers to smooth cut lines and indent further if needed. Rub your finger on top of black chalk. Make sure your finger tip is fully loaded with black chalk powder. Rub the chalks all over the ridges, sides, and edges of the arrow. This will give a nice dark and aged finish to your arrowhead. Bake your arrowhead at 275 degrees Fahrenheit for 45 minutes.